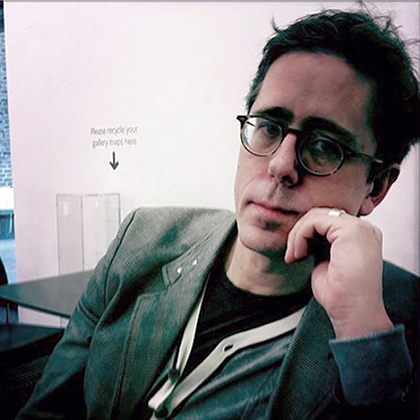 Dr Mark Ingham is the Design School Learning and Teaching Innovation Lead at London College of Communication. Mark is a fine artist who uses old SLR film cameras and LED lights to create multiple slide projectors in large scale art installations. His installation ‘120 Days and Nights of Staggering and Stammering’, is designed using 120 SLR film cameras and LED spotlights. Each of these handmade projectors displays images taken before and during the installation of the work, as well as audience-donated images. Regardless of where the work is installed, the end result reflects the experience of the viewer within it. His current project, ‘Stalking Sculpture’ is an attempt to find, film and photograph every public sculpture in the world, surreptitiously. Mark’s teaching is based on enhancing the student experience and has been central to his practice as a lecturer and his educational thinking. He engages students in a critically challenging and supportive atmosphere in all the courses he teaches and designs. He enhances programme and curriculum design so students go beyond what they think they can do and achieve the highest degree of creative thinking as possible. His art and design research includes, relationships between autobiographical memory and photography, Gilles Deleuze’s and Felix Guattari’s ideas of ‘Becoming Rhizomatic'. His pedagogical research into the relationships between theory and practice and their roles in art and design disciplines has made him acutely aware of the importance of an holistic approach to teaching. He used his knowledge of making and doing skills, including design and multimedia software, in combination with his practical and theoretical knowledge to give students a full and rounded educational experience. Mark is an external examiner at London Metropolitan University, Middlesex University and NCAD, Dublin."